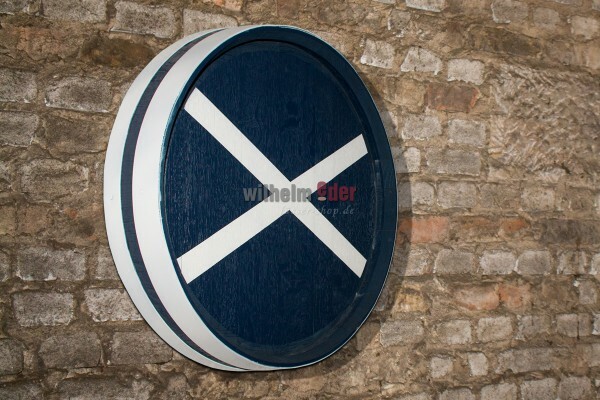 Product information "Barrel head - Scotch flag"
The decorative barrel heads have been made out of old barrels by our carpenters. The barrel heads have been cut from old wine barriques to a length of about 9-15 cm (depends on the placement of the hoops). The wood of the head have been treated with paint and shows the flag of Scotland. The height of the heads depends on the origin of the barrels and the placement of the hoops. The pictures shown are examples and variations in color are possible. While ordering your barrel head please write down your desired version in the comment field. Of course we also produce barrel heads according to your individual requirements. Just write an Email or we use our contact form.